The jet boat leaving a foamy wake behind it. 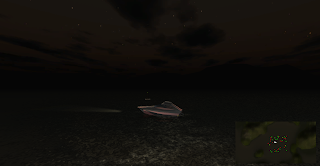 This tech demo features a streamlined jet boat designed by Flyman (from Mars Explorer) surrounded by a large expanse of water. Some red and green lit buoys aimlessly drift along in the darkness of the night. Land masses partially obscured from view are visible in the distance. Vehicle Controls: WASD or Arrow Keys to drive. Camera Controls: Click + drag to orbit, scroll-wheel (two fingers for Macs) to zoom. Seems pretty nice. I love the water and model itself. The one con I found is this was the control was either too responsive or unresponsive. So 2 stars for model, 2 stars for the effects and .5 point for like-ability. I updated the handeling from when I last showed it to you. It's a lot easier to steer where you want it to go and much more realistic. Very good job! Is it possible to download sources? Good to know about this. If you are thinking to visit the amazing destination for sightseeing then, enjoy your vacation at jet ski algarve and have great time there.